On my way to Lake Tahoe this summer, we stopped at a restaurant in Carson City where Lily got her first kids meal. In addition to crayons, this restaurant gave her a small package of Wikki Stix to play with. Since she was content with the crayons, I gave the package to my little brother who made this (pictured below) out of them. (Less than appropriate, but very creative.) 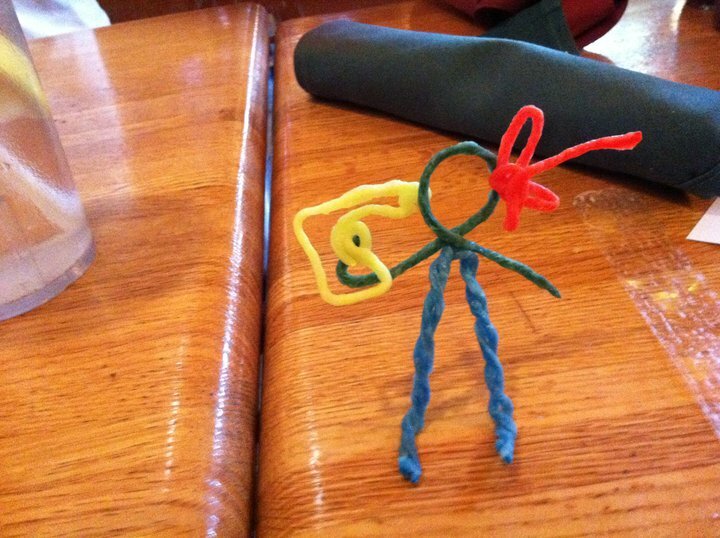 I wish more restaurants here had Wikki Stix for the kids. They aren't messy and they wouldn't have to worry about kids drawing all over their tables with their crayons. The Trick-or-Treat pack came with 50 individual bags which each have 8 Wikki Stix, and a Halloween themed play sheet. The trick-or-treaters at our house this year are going to be so excited when they get some Wikki Stix of their own to play with! We all had a ton of fun one night playing with the Wikki Stix making a whole bunch of things. Each pack comes with at least 1 template. You can use the template to make a shape, then peel it off if you want to. Each Wikki Stick is just yarn covered in wax, so they are easy to mold and no mess at all. The Wikki Stix stick to windows easily but don't leave any residue when you take them off. My brother made this spider and web and stuck it to the window. What a great Halloween decoration! The boys really got creative with this project. (See my brother's Wikki Stix glasses above?) We put off the rest of our plans for the night to keep playing because we were having so much fun. My husband made a motorcycle. We were pretty impressed with his creativity. My sister-in-law came over last night and made a digger while we sat and talked. I'm not even going to post the 3-D cat I tried to make - apparently sculpting things with wax strings isn't one of my gifts in life. 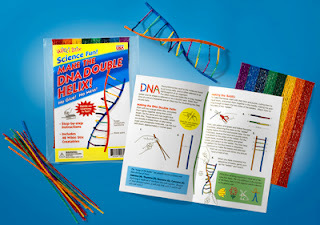 As I was checking out the site I saw Wikki Stix for school - below is their DNA pack. How cool would it have been in class had my teacher handed out these low-cost teaching tools and let us make our own double helixes? Don't these things look awesome? It's genious. Do you want to play too? 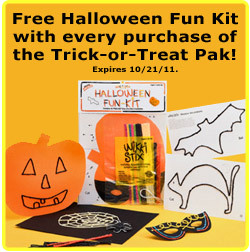 1 winner will receive a trick-or-treat pack and Halloween fun kit just like I received! TO BE ELIGIBLE: You must be a public follower of this blog. TO ENTER: Leave a comment telling me what Wikki Stix product you like best. This giveaway will end at 11:59 PM (Mountain Daylight Time) on October 8, 2011. CONGRATS TO CHELLE WHO WON THIS GIVEAWAY! My kids would go crazy over these! They love the halloween ones. I am a follower of your blog, and your blog on facebook. Hi! Stopping by to follow back... thanks for visiting my blog! that looks so much fun!!! I follow your blog on GFC, subscribe to your email and like you both on Facebook! I would love to win this for my kids! I really like the tall giraffe too! Thanks so much for the terrific giveaway! I like the DNA pack the most. It would be so cool to be a science teacher and teach a lesson with them! 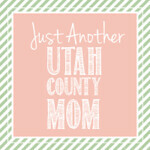 I 'liked' Utah County Mom on Facebook. I 'liked' Wikki Sticks on Facebook too. this would be great for my son! i would be good with any of their sets. I follow on GFC and I like the Big Count Box. The Birthday party kit looks like it could certainly be useful! The Dinosaur Fun Kit is neat. Already liked Wikki Stix on facebook. I'm a follower on GFC and I would love the Neon Pack! I like the alphabet cards.I follow on GFC.Thanks! I like wiki stix on FB as Leslie Luke Stanzinai.Thanks! Ah, look at your husband's motorcycle. Love it! I follow with GFC (mail4rosey) and I like the Create a Card kit. I like Wikki Stix on FB (Sarah Smile). Glow in the Dark Wikki Stix are so cool! i like the glow in the dark ones. The birthday party kit looks fun! Liked Wikki Stix on Facebook. I'm a google friend (pauline15_01) and I really like the After School Fun Kit for after school, especially during the winter months when my kids are limited in outside playtime! I like the create a card fun kit. public follower i like the glow in the dark. 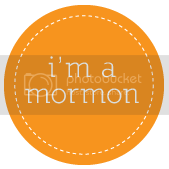 I am a gfc follower! My daughter would love the ones that glow in the dark! !